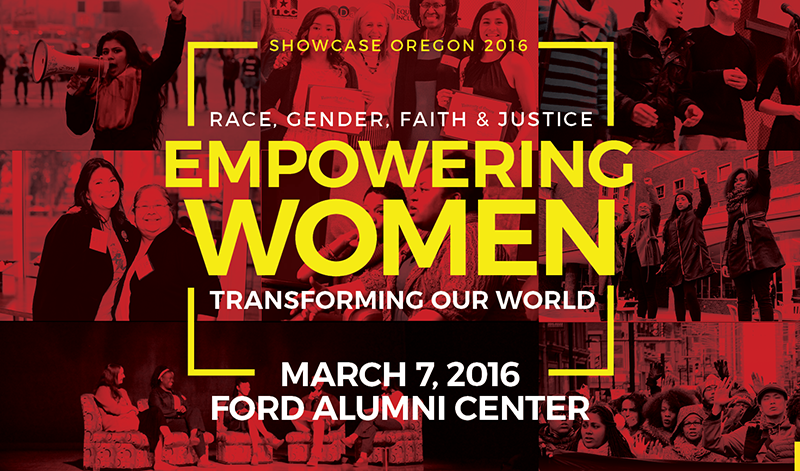 The upcoming Showcase Oregon, a biannual event put on by the Division of Equity and Inclusion, will explore the theme “Race, Gender, Faith and Justice: Empowering Women, Transforming Our World” when it convenes Monday, March 7. The gathering will take place in the Ford Alumni Center, starting with a breakfast at 7:45 a.m. and a welcome by UO Provost Scott Coltrane at 8 a.m., followed by remarks from Vice President for Equity and Inclusion Yvette Alex-Assensoh. Showcase Oregon highlights practices around issues of equity, inclusion and diversity that can be incorporated into university policies. The event has helped craft and implement new university policies aimed at improving diversity at the UO. After more than 300 people attended the event in 2014, diversity programs across campus were affected in a positive way. The Division of Equity and Inclusion partnered with Erik Girvan, a UO law professor, to design and implement a pilot training course on implicit bias for members of the UO senior leadership team, including the president, vice presidents and deans. This year, that program is being offered campuswide. The effect of last year’s Showcase event is also evident in new partnerships between the Division of Equity and Inclusion and the Office of the Provost and Academic Affairs, as well as the Office of Affirmative Action and Equal Opportunity. The partnerships were established in an effort to work one-on-one with various school deans in helping to diversify applicant pools, establish mentor programs and to bolster the university’s existing diversity programs. The upcoming day-long event will focus on the theme of justice at the intersection of race, gender and faith and how those aspects of identity interplay with the campus as a whole and the surrounding community. Specifically, the symposium will feature the ways women facilitate justice using their skills, talents and wisdom to have a positive effect on the lives and the institutions they are a part of. In addition to hearing from women academics, entrepreneurs and higher education leaders, the event will feature panels of student and activists, poster sessions and remarks by Coltrane and Alex-Assensoh and a call to action from Belle Wheelan, the president of the Southern Commission on Colleges. The event also will include a continental breakfast, a lunch session featuring a teach-in on the Movement for Black Lives and a closing reception. The event is free and open to the public so space is limited and an RSVP is highly encouraged. An online invitation is available to register for the symposium. For a full list of speakers and the complete schedule, visit the Division of Equity and Inclusion’s website.